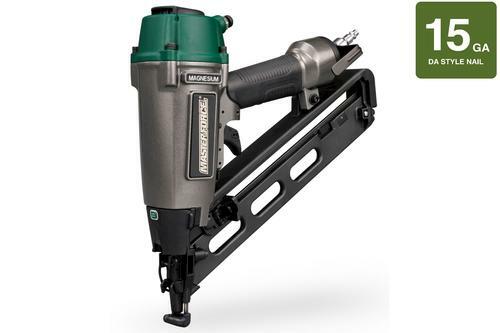 The Masterforce® 15-Gauge Angled Finish Nailer drives 1" to 2-1/2" 15-gauge angled finish nails. It can be used for many different finish work applications. It features an LED Light to help brighten dimly lit work spaces, an integrated push button Air Blower for clearing off dust covered work spaces, a lightweight magnesium housing and molded rubber grip so you can install your trim and finish products with more comfort and less fatigue. An easy change sequential/bump fire trigger, tool less depth of drive adjuster and no-mar wear contact element allow for greater ease of installation and a high level of tool and material control. 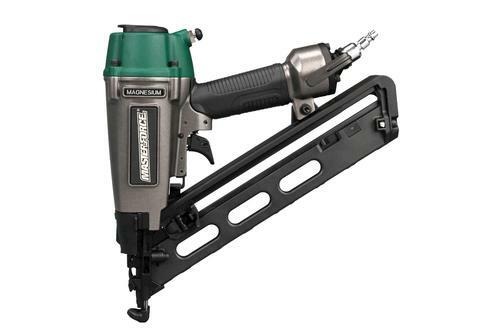 With this Masterforce® Trim Nailer at your side, you are able to handle any finish work professionally.